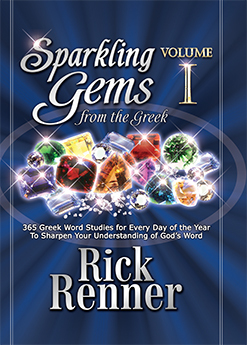 Description: In Sparkling Gems From the Greek, Rick Renner unlocks an amazing cache of rich, enduring treasures mined from deep within the Word to unveil a wealth of brilliant wisdom and sound counsel that will enrich and redefine your life. Sparkling Gems is arranged in a devotional format with more than 1,000 in-depth Greek word studies, crafted into 365 daily devotions that are sure to inspire and provoke you to plunge deeper into your own search for more hidden treasures from God’s Word. Three exhaustive indices — an English to Greek index, a Greek to English index, and a Scripture Index — are also included, making Sparkling Gems a highly effective reference tool for your own personal study library. So let wisdom and enduring riches define your life as you delve into the depths of God’s Word with Sparkling Gems From the Greek by Rick Renner.